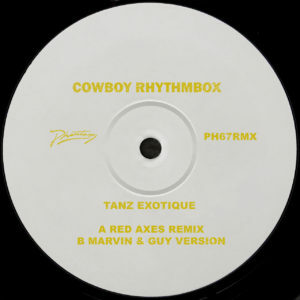 Initially described as “superlative 25th century electronic exotica” by Cowboy Rhythmbox themselves, the fourth EP from Phantasy’s in-house trouble and hitmakers received support from top jocks including Dixon, Jackmaster and Marcel Dettmann. Now, it’s dynamic lead track is rejigged, expanded upon and shot through with analogue energy by two equally inventive producer pairings. Fellow outsiders on the inside of the house of house, Israel’s finest Red Axes take the first turn, coaxing the cosmos out of the original and allowing the bewildering vocal samples to lead the way through waves of more than pleasurable cosmic tension. Soon, with the timing just right, feet to pedals and strobe to hand, the pair unleash a series of distorted guitar licks that blow dust off the stacks, even throwing in a sharp blast of their trademark surrealist vocals for extra freaky FX. On the flip, Marvin and Guy zone out and hone in on the original’s EBM-indebted elements to contribute a trippy, wave-riding electro rework that oscillates irresistibly. Teasing listeners with a playful, almost naive synth line, the mood shimmers instead with uncompromising acid, as the pair ultimately push the modulars into strange and hypnotic territories to get lost in.